Leadnow (www.leadnow.ca) is an independent advocacy organization that runs campaigns on the major issues of our time, engages people in participatory decision-making and organizes in communities across Canada. The organization envisions a country where people work together to build an open democracy, create a fair economy and ensure a safe climate for all generations. It’s been just over three years since 3,000 people from all across Canada came together before the 2011 election and began building the leadnow.ca campaigning community. People become part of this community by taking part in campaigns to defend our democracy and hold governments accountable to the values of a majority of people across Canada. Do you remember how you felt after the last federal election when you heard the news the Harper Conservatives had won a majority government? I felt like I’d been punched in the stomach. How could a seemingly progressive country like Canada elect a government that slashes budgets and is dead-set on becoming a dirty oil superpower? It happened because of vote-splitting in our broken first-past-the-post voting system. Even though a majority voted for a new government against the Conservatives, their votes were split between the Liberals, the NDP and Greens. And because of our electoral system, this handed the Conservatives 100% of the power, with less than 39% of the vote. Like me, a lot of people across the country were outraged. More than 55,000 people signed a Leadnow petition urging opposition parties to cooperate in ridings where Conservatives won because of vote-splitting and to then pass electoral reform. The idea of formal cross-party cooperation to defeat the Conservatives has been a contested topic among opposition parties. Despite various levels of commitment to cooperation and electoral reform from opposition leaders, both NDP leader Thomas Mulcair and Liberal leader Justin Trudeau have committed to going alone in the next election. It’s now up to voters to take matters into our own hands. It’s up to us to make sure we get the progressive government that we want – a government that’s committed to fighting climate change, investing in a fair economy and improving our democratic institutions. Now, the 2015 election is just around the corner and despite their record, the Conservatives could win again. The fate of the Harper Government will come down to a few dozen swing ridings where the outcome could be decided by a few hundred votes. If the vote splits in these key ridings, we could face four more years of Harper. Leadnow just launched a three-step campaign to unite progressive voters across party lines to defeat the Conservatives in 2015. Leadnow is building a bloc of voters who commit to working across party lines to defeat the Conservatives by collecting signatures on a pledge. More than 10,000 voters have already signed the online pledge to Vote Together and volunteer teams are forming across the country to collect pledges with a door-to-door campaign. As more people in a riding sign the pledge, Leadnow will focus more resources into helping voters in the riding unite behind one candidate. If 1,500 people sign the pledge in a riding, Leadnow will commission a poll to find out which candidates have the best shot at defeating the Conservative. The results of the poll will be reported to supporters in the riding, along with research and background on the candidates running in their areas so people can vote with the best information available. 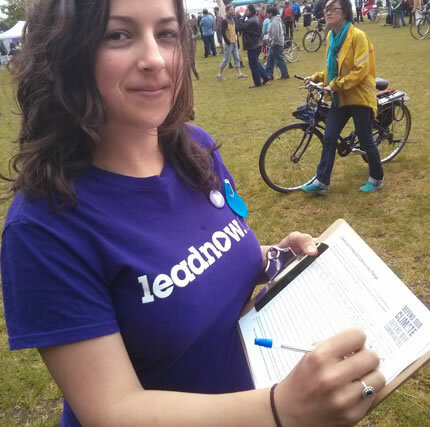 If thousands more sign the pledge, Leadnow will ask voters in the riding if they want to formally endorse a candidate. In order to win the endorsement of the Leadnow community, candidates would need to be electable – meaning they have enough support in the riding that they have a legitimate shot at defeating their Conservative opponent – and acceptable – meaning that Leadnow supporters accept their positions on the issues. If an endorsement is made, Leadnow will work to unite supporters behind the endorsed candidate. Whether or not a candidate is formally endorsed, Leadnow will work to get out the vote to make sure hundreds of thousands of progressive voters show up and vote on election day. Leadnow has heard loud and clear from our supporters that while defeating the Conservatives is an important priority, our campaign has to be about more than ousting Harper. Leadnow formed to work for an open democracy, climate justice and a fair economy in Canada and while Harper is standing in the way of progress on these issues, we know our goals can’t be accomplished just by changing the government. To make long-term progress, we need power and we need politicians to take us seriously. Having a visible impact on the 2015 election helps build the power we need – if politicians know that our community has the power to make a real difference at the ballot box, they will do better at truly reflecting our interests. You can get involved by going to votetogether.ca to sign the pledge to Vote Together or by calling toll-free 1-855-LEADN0W (1-855-532-3609). You are correct in your method however it is bigger than just defeating Harper. By voting in a block is the only way that the Canadian people can take back control of their government. Harper is reflects the conservative upperclass well as business interest in Canada. This is not nessecarily the same as the needs of the Majority of Canadians. Harper is a traitor of Canadian Nation! He sold us to CIA. He has to go to… Only blind don’t see it! This concept may have merit if it results in a Conservative loss in the next election. But are the Liberal’s policies really that much different than the Conservative’s? I have been a NDP supporter for many years and would be uncomfortable switching my vote to the Liberals as they, like the Conservatives, are in allegiance with the Big Corporations, haven’t spoken out against Big Ag, GMOs or restrictions on Oil Companies and fracking and their effects on the environment. I have other concerns as well. As I said, this idea has merit in theory but in practice, I’m having some difficulty warming up to it. ABC needs lawn signs – make damn sure that every Canadian knows the potential power of ABC. Ya – that’s not what’s being said here. The candidate in your ridding that has the best chance of beating the conservative candidate gets your vote – that candidate certainly has my vote. There is this conservative strategy in place that seeks to pit the opposition parties against each other when they see mention “ABC” – that is proof positive that the Harper government feels very threatened by the “ABC” movement and that action is proof that “ABC” will work – it made sure that Tim Hudak didn’t get hands on power and this same strategy will remove Stephen Harper from the PMO. What we need is a rally…coast to coast to coast. PROMOTE THE VOTE! In order to get rid of Harper, we cannot afford to split the vote (which we will if we vote for our party of choice). We must vote for whichever opposition party candidate has the best chance of beating the CON in each and every riding…if we really want to oust Harper! ABC – wisely! Vote ABC – S t r a t e g i c a l l y Canada! 2015. I’m interested in helping, but it seems to me we’re beyond the point of influencing the nomination process. Do you have a process for identifying swing ridings? Do you have a process for identifying an electable candidate among the candidates selected by the main parties? Would you consider a Green Party candidate as the most acceptable alternative? I don’t want you to be pushing people towards a “Liberal landslide” when we have no idea whether either Trudeau or Mulcair is an effective national campaigner. In particular, I fervently hope that Elizabeth May gets re-elected. I live in NDP Peter Stoffer’s riding of Sackville Eastern Shore, and I expect he will get re-elected, but I have no evidence for that at this point. Will Bill Casey win the Liberal nomination in Cumberland Colchester Musquodoboit Valley? I have all sorts of questions, but no solid answers at this point. Leadnow.ca seems to be saying they have the answer, at least to some of those questions. We’d love to see the NDP form government and implement Proportional Representation as they’re promising to do. We need a government of diverse voices in an ethnically and geographically diverse country like Canada! Michael Ruxton is exactly right. Furthermore, it’s no longer a left-vs-right matter and we should not assume that people interested in defeating the current incarnation of the Tories are on the political left. There are a good many Red Tories who would just love to turf Reform. What is needed is a website labelled something like “Heave Steve” where people can go to find out who in their riding has the best chance to defeat a Tory incumbent, or prevent a new Tory face. That could simply be based on the vote last time, irrespective of policy promises, which are generally nonsense anyway.